A hit podcast by and about the prisoners of San Quentin. In a shabby, low-slung bungalow on the grounds of California’s San Quentin State Prison, Adnan Khan sits nervously in front of a microphone. A slender 33-year-old with dark, slicked-back hair and skin the color of cinnamon, he’s clad in typical prison fashion—jeans, powder-blue button-down over a white T-shirt, standard-issue dark jacket. 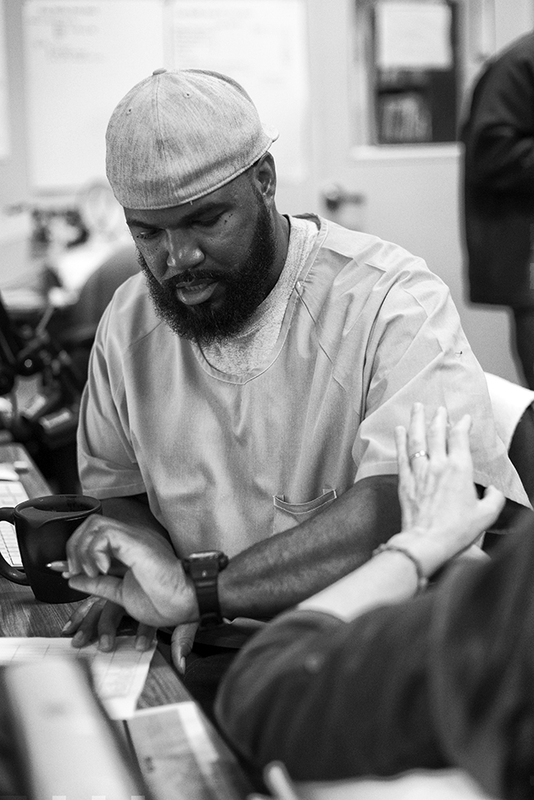 To one side, inmate Antwan Williams sits at a workstation wearing headphones while fellow prisoner Earlonne Woods and longtime San Quentin volunteer Nigel Poor—Williams’ co-producers on the hit podcast Ear Hustle—prepare for Khan’s interrogation. 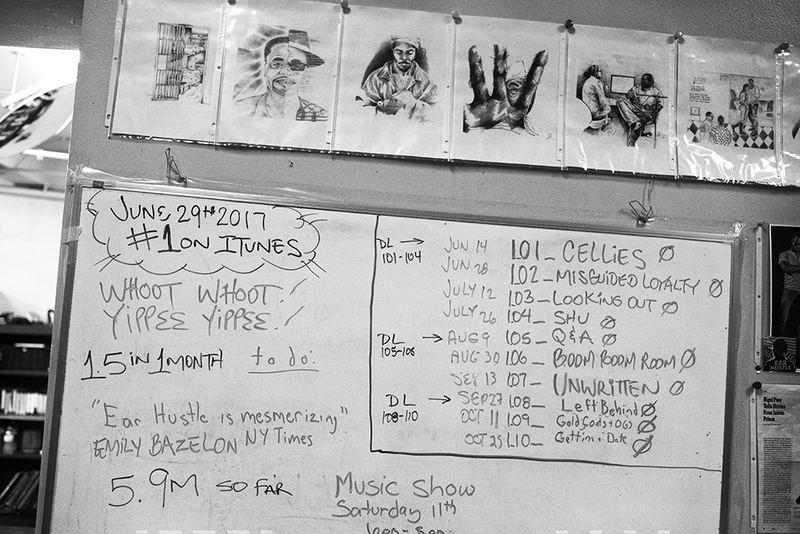 A whiteboard still displays the first season’s episodes, with one date highlighted: June 29, 2017—the day Ear Hustle hit No. 1 on iTunes after it was featured on the Today show. A second whiteboard lists new potential topics, such as “ministering on death row” and “gangsters and literature.” Today’s session is for an episode on “prison firsts” that will air during the podcast’s second season, which launches on March 14. Khan’s story, at its heart, is about estrangement. At 18, he took part in a robbery in which his partner fatally stabbed a man. Khan got a sentence of 25 years to life. He’s here to talk about the day a few years ago when his mom first came to visit him in prison. A white board shows last season’s podcast schedule—and one very special date. This piques everybody’s interest. It turns out that Khan hadn’t hugged anyone during his decade-plus inside. He’d actually forgotten how to do it. Should his arms go around his mom’s shoulders? Her neck? He practiced in his cell by giving himself air hugs, but in the end, he let her lead. His shoulders were tight, his body like a steel rod. The hug didn’t have “too much grasp,” he adds, and he felt like a robot. But his mom held on and wouldn’t let him go. Ear Hustle stands out in the podcast realm for its textured stories about men coping with the challenges of incarceration. One episode unpacks how San Quentin’s unofficial party planner navigates the unwritten rules of race. Another covers intimacy in prison and highlights how nerve-wracking it is for guys to prepare for the tenderness of a family visit after having to act macho for so long. Woods, stocky with a shy smile, is 19 years into a 31-to-life sentence for attempted second-degree robbery. 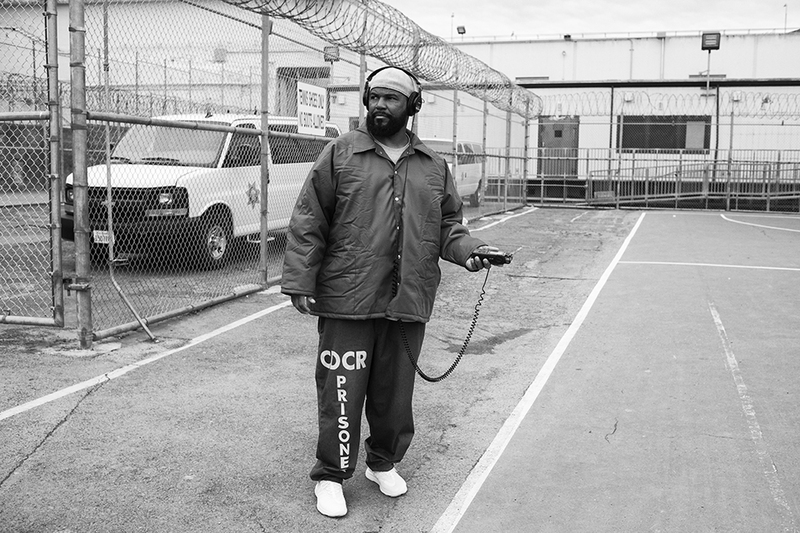 He plays the role of tour guide, alternating lines with Poor and explaining to listeners how things work in prison—”ear hustle,” he notes in the debut episode, is prison slang for “eavesdropping.” Williams, the athletic-looking sound designer, works behind the scenes to compose the music and edit episodes. At 29, he’s served 10 years of a 15-year sentence for armed robbery. The first season, Poor tells me, has attracted many thousands of letters and emails from fans ranging from high school kids to district attorneys. Ear Hustle co-host Earlonne Woods, who is serving 31 years to life for attempted second-degree robbery, deals with some production tasks. Julie Shapiro, executive producer for the podcasting outlet Radiotopia, knew Ear Hustle had potential the moment she first heard it. That was back in 2016, when Poor caught wind of Radiotopia’s talent-seeking contest. The prisoners she worked with were already considering a podcast, and so, basically on a lark, the three put together the required audio samples and ended up winning. Radiotopia rewarded the project with a distribution deal and funding they used to acquire high-quality production gear. “Their pilots,” Shapiro told me, “showed the promise for a very sophisticated, nuanced, sensitive, humorous way of telling stories—from a place where you wouldn’t suspect any of that. 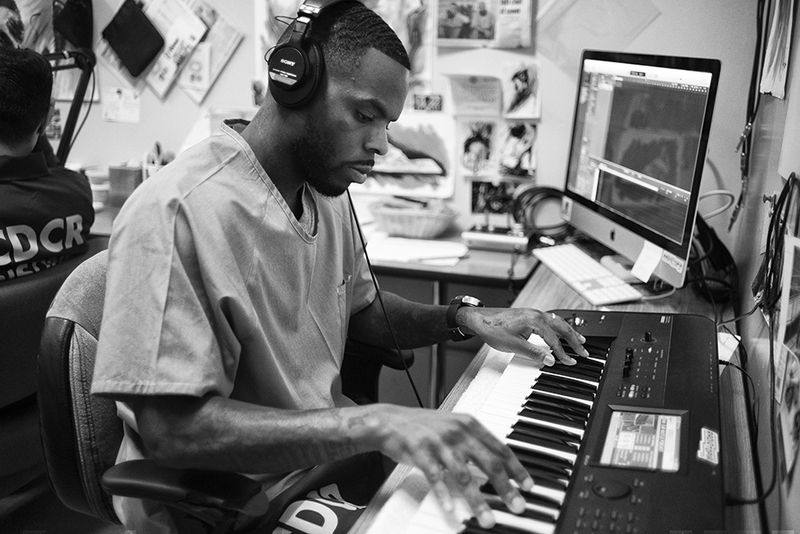 Antwan Williams, sound designer and co-creator of Ear Hustle, is serving a 15-year sentence for armed robbery. He composes all the music for the podcast. Producing a podcast in prison is more complicated than it is on the outside. You work when you’re allowed to and include what the authorities say you can. Each completed episode is submitted on a CD-ROM to Lieutenant Sam Robinson, San Quentin’s public information officer, for approval—a process that can take anywhere from hours to a week. Robinson says he has yet to shoot down an episode, but there’s no question who’s in charge. Last August, production was suspended for nearly three weeks while the facility went on lockdown. “There’s no investigative journalism in prison,” notes former inmate Troy Williams, who hosted a show called the San Quentin Prison Report during his incarceration. Near the beige administration building, visitors encounter a second checkpoint where they show ID, get a hand stamp, and proceed through an ancient-looking iron gate into an impossibly lush courtyard flanked by a medical center and a chapel built in the same style. Were it not for the hulking stone building in the distance (death row), it would be easy to forget you were at a prison. Located on the San Francisco Bay in pricey Marin County, San Quentin is a study in jarring juxtapositions. To get there, you drive through San Quentin Village—a long road with quaint single-family homes (former staff housing) where middle-class white folks walk their dogs. The road ends at the prison’s perimeter gate. Woods and co-host Nigel Poor interview a prisoner on the yard. As Woods explains in one episode, inmates would much rather be here than at other facilities—say, Folsom or (God forbid) the notorious Pelican Bay prison. San Quentin, which houses both medium- and maximum-security inmates, boasts a wealth of programming. There are college-level courses through the Prison University Project, a baseball team, coding seminars, yoga classes, and the multimedia program that gave birth to Ear Hustle. These activities, plus San Quentin’s proximity to an urban center, make it a destination for volunteers and luminaries. The NBA’s Golden State Warriors stop by every year—photos of coach Steve Kerr grace the walls of the multimedia studio. 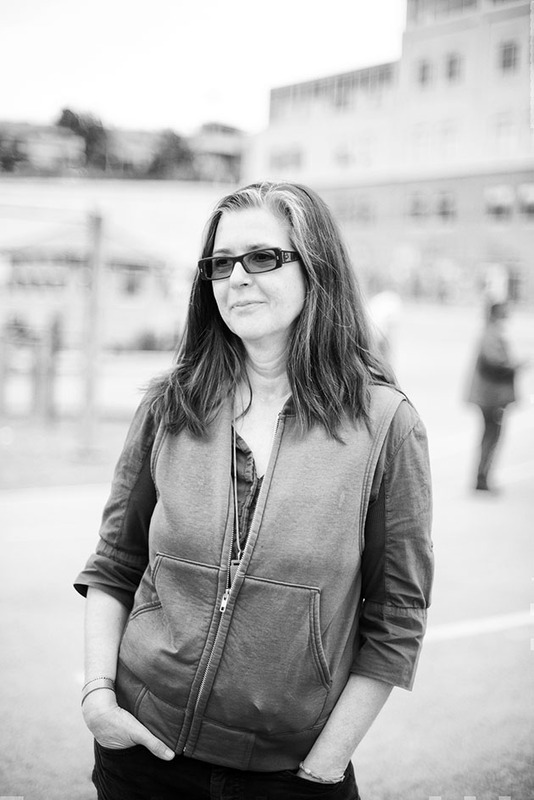 Co-host Poor, who teaches photography at California State University, is a volunteer in the prison media lab. Woods gathers ambient sound on the yard for an upcoming episode. Woods and Williams are justifiably proud of their success, yet it raises a question: Who benefits? Working in the media lab earns inmates standard prison wages—less than $1 an hour—and California state law forbids inmates or volunteers from profiting directly from their media endeavors. (For now, Radiotopia uses the show’s sponsorship and donation income to cover production expenses—about $30,000 for season one, according to a corrections department spokeswoman.) While a parole board might view the men’s work favorably, that prospect is years away. 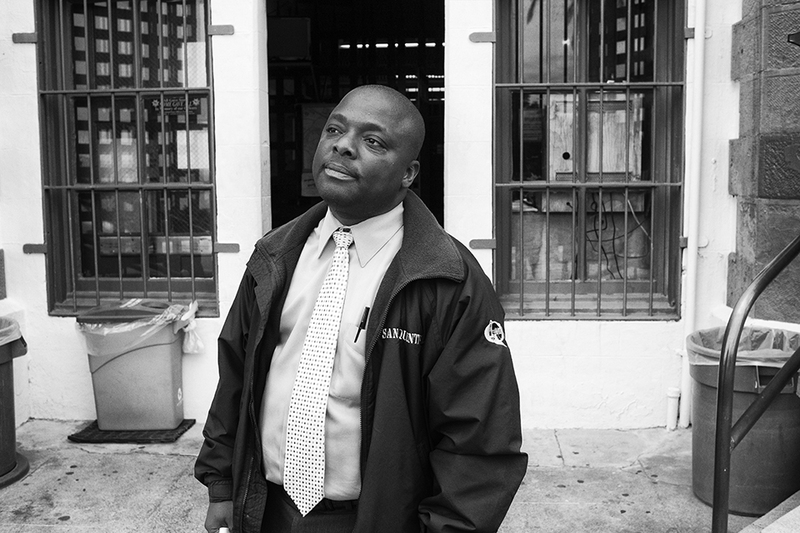 Lieutenant Sam Robinson, San Quentin’s public affairs officer, signs off on each podcast episode.